Katoomba is well known for spectacular mountain views and extensive bush and nature walks in the surrounding Blue Mountains area. Katoomba is the chief town of the City of Blue Mountains in New South Wales, Australia and the administrative headquarters of Blue Mountains City Council. Ka-toom-ba is an Aboriginal term for “shining falling water” and takes its name from a waterfall that drops into the Jamison Valley. The name Katoomba was adopted in 1877 and the town achieved municipality status in 1889. 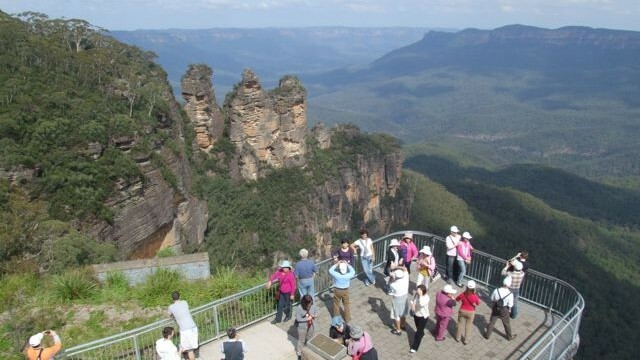 Katoomba’s main industry is tourism based on scenic mountain scenery. The rock formation known as the Three Sisters, viewable from Echo Point about two kilometres south of the main town, is the most famous feature. A short walk from Echo Point leads to The Giant Stairway which provides access to a number of nature walks through the Valley. Some of these are quite rugged and not recommended for inexperienced walkers. The local geography includes extensive areas of dense sub-tropical rainforest, hanging swamps and a series of waterfalls with a relatively low water volume. Katoomba is well-served by hotels and guest-houses, the oldest and most prominent of which is the Carrington Hotel, established in 1882 and occupying the highest point in town. The nearby village of Leura also features numerous well-appointed hotels and health spas and Medlow Bath boasts the Grand Hydro Majestic Hotel, originally built in 1891. The busy town centre, centered on Katoomba Street, features dozens of cafes and restaurants, including the Paragon which dates the early 1900s, as well as a number of second-hand book and antique stores. The scenic beauty and tranquillity of Katoomba and the surrounding Blue Mountains area have long made Katoomba a haven for Sydneysiders looking for rest and relaxation.